Place pins on a worldwide map for each location you want to visit, then see your route. Enter trip details for each location and create a complete trip itinerary. 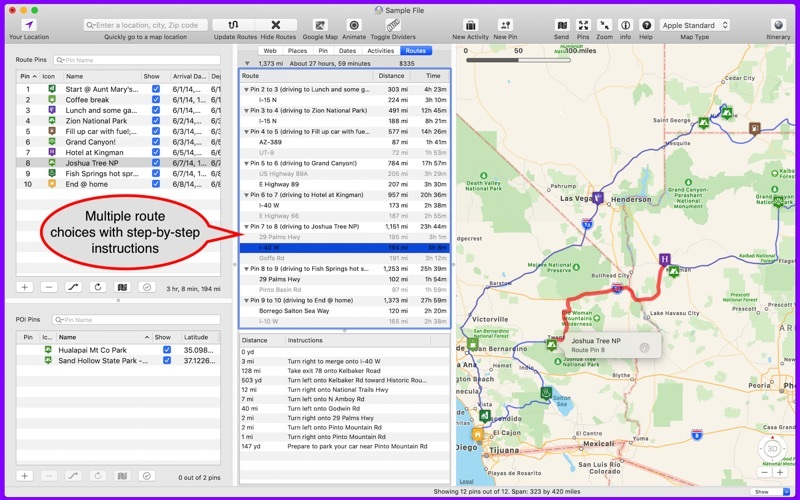 You can DEMO this app with Road Trip Planner LITE also available at the Mac App Store. Unlike other trip planning apps, this app has NO SUBSCRIPTION FEES. MAP PINS HOLD WHAT YOU NEED. Each pin shows: - arrival date & time - departure date & time - travel time to this location - time spent at this location - name of pin (such as John’s house) - address of pin - notes and images - custom pin color and icon (choose from over 90 designs or import your own) - URL for related information - URL for related images - weather reports from NOAA and Wunderground - nearby web cams - Flickr photo search - elevation - transport type (driving or walking) - satellite view - Internet Search results - list of activities (lodging, sights to see, etc.) - choose between multiple routes (if available) - set the route color between pins - between pins view driving distance, driving time, fuel cost, travel advisories, turn-by-turn driving directions - import pins from your Contacts (select as many at once as you like) EACH PIN CAN HAVE MANY ACTIVITIES. For each activity you can record: - name of activity - activity date, time and duration - cost - phone - FAX - address - URL - email address - confirmation number - notes - picture There are two types of pins. Route Pins are used to create the route. POI Pins mark points of interest on the map. Choose between Apple Maps and OpenStreet Maps. Choose between driving and walking for each pin. For air and rail routes a straight line can be displayed between pins. Add, remove or rearrange the pins in any order you wish. Search for places such as restaurants or hotels near each pin. Routes and pins can be sent to Apple Maps. Each trip can be saved as a separate document. Perfect for anyone who wants to maintain a record of past trips. PUT YOUR TRIP IN YOUR GPS device. 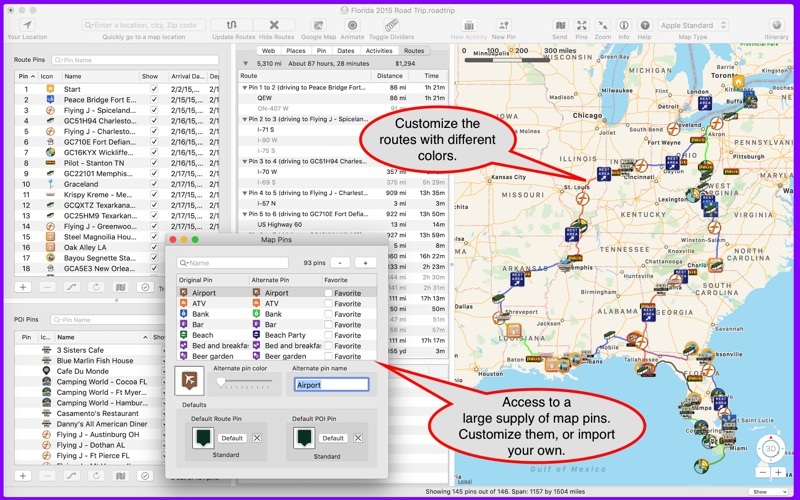 Route pins and routes can be exported as GPX files that can be imported by many Global Positioning System devices. 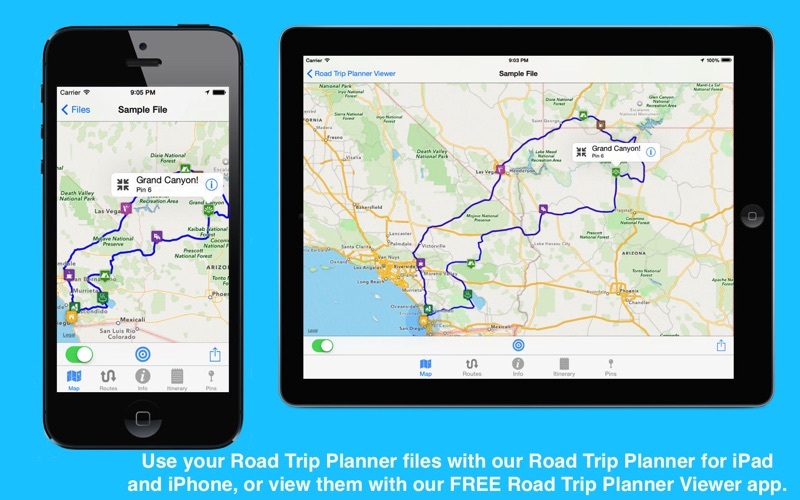 VIEW YOUR TRIP ON YOUR IPHONE OR IPAD with our Road Trip Planner app for iOS, or use our FREE Road Trip Planner Viewer app. Or use apps that import GPX data, such as our GPX-Viewer app. Multiple sample files are available as well, including an informative Route 66 sample file. THE ITINERARY HOLDS ALL OF THE DETAILS. Share it and take it with you. 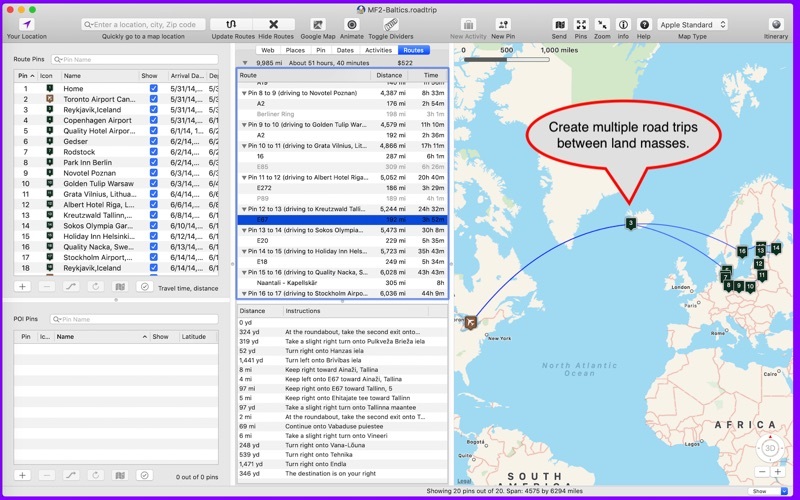 - display the itinerary in a separate window - save the itinerary to disk or share it easily - optionally include a map image with pins and routes, activities for each Route Pin, costs for each activity, total fuel cost, total trip cost, information for Points of Interest Pins, and driving instructions USE THE TO-DO CHECKLIST. Make sure you don’t forget anything. Import location data from our other map-related apps. For a complete list visit website below. Development is very active and we have many more features planned. We respond quickly to suggestions and questions in our forum. PLEASE CONTACT US IF YOU HAVE A QUESTION OR AN ISSUE. We promise we'll respond as quickly as we can. 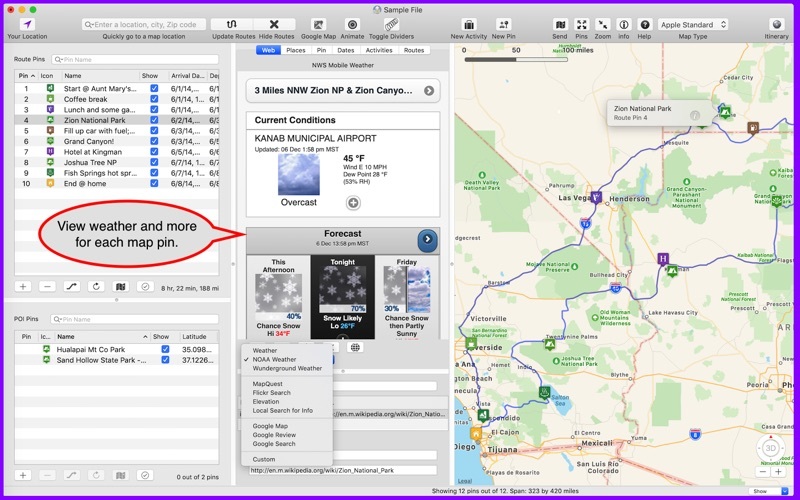 For more info, screenshots, videos, and support questions click on the Road Trip Planner support button or visit http://roadtripplanner.modesittsoftware.com PLEASE READ CAREFULLY BEFORE PURCHASING: The mapping and routing functionality Road Trip Planner uses is based upon Apple’s maps technology. If Apple Maps cannot find a route between map pins, then neither can Road Trip Planner. Please test the area you wish to travel using Apple’s Maps app to ensure that the area can be routed. If it cannot be routed, please submit the issue to Apple at http://www.apple.com/feedback/maps_mac.html. If Apple Maps cannot perform routing in the area you wish to travel then neither can Road Trip Planner. I've been using RTP on iOS and MacOS for some time. Most recently I've been planning RV roadtrips with great success. The ability to calculate arrival times is invaluable. It's super easy to adjust and recalculate based on how long you stay at a location. The ability to add notes to route pins helps me keep track of activities and highlighs I then use to journal. I think the capability of the software is very good and the complexity is not overwhelming. With a little effort one can easliy master the software and gain substantial benefit. I just got this application after being on a road trip for the past week. Plan to travel for another 5 weeks and will give an update at that time = Mid May, 2019 Somebody read my mind when it came the features i was looking for. WOW!!!!!!! Another user made comment that there is a steep learning curve. Yes and no. I have been sitting in my camper for the past hour and already feeling very confident that this app is just what I wanted. I’ve tried hard to use this app for 2 seperate trips and it just gets way too hard. Today I tried again and was almost done when it booted me out and locked up my Mac. I will delete it from my computer because it’s just a waste of space. Well this is my first try at using an app to help with a road trip. We pull a toy hauler RV and go places then take our Harleys out for a nice planned ride. Well the main issue that I have is the fact that no matter how dilligant I am about planning the route I want to take, this app can not give you turn by turn directions. It cannot send the route to your phone. Only the waypoints and it does not keep the waypoints in the proper order. I guess if I wanted to use a GPS device that can read a GPX file or spend more money on a phone app that might work it would be great. I like the fact it can estimate your fuel cost but I can do that in my head. It is great at helping you plan your trip and keep your POI’s and other info in order. But does very little in helping you get there. It would be great if you could plan your trip at home then send the trip to your phone with the route you want to take and it be like you expect. Not re route you on roads you do not want to take or take you places you do not want to go. I guess I have to decide whither I want to spend some more cash and see if I can make a GPX file to work. The main point is, it does do what it says it will do. Just don’t expect any more. I think the price point is a bit high for what you get. Update, I decided, if I was going to need to spend more money to get the navigation, I would look around a bit. I found an app for my iPhone that I think will do what I need. At least I can plan my rides and travel with no worry about it changing the route unless there is a serious problem ahead like weather or closed road etc. But this is a great app for planning long trips and estimating your cost. This app is very hard hard to use. It is not up to the apple standard as for as I am concerned. Like I said, I found and app “InRoute” that is for my iphone that will let me route my trip and give me turn by turn directions. It well not deviate from that route or change that route untill it notifies me of weather and traffic alerts ahead. The InRoute app is great. Check it out in the App Store. after reading the review, I decided to try the Lite version first. It took a short learning curve but once you try it a few times you should be a whiz with it. I have since purchased the full version and am quite satisfied. Have several trips planned on it and will have many more. But like I said download the lite version first to get a feel for it. Might not be intuitively easy—but what an app! Used this app extensively for a cross country move from AZ to ME. Was able to plot hotels, world’s largest ball of twine and other spots of interest along the way. Agreed it has a steep learning curve, but once mastered? Its a gem and an indespensible tool! Hope to use it more and more, many thanks for a great app! This is THE PREMIER route planner on the Apple platform! Like any great app, the more time you spend with it, the more you’ll appreciate it. ——-- Below is my review from Jan 22, 2015 ------ This app keeps getting better and better, as shown by the improvements to the Help menu and the capability to have more than 100 route pins in version 2.7.2. Don’t believe the negative reviews. Many are old, and in most cases the reviewer did not spend a few minutes to become familiar with this app. It does not have a steep learning curve like Photoshop, but it does require some time to learn all of the various features. Time well-spent… the rewards of this app are many. ——-- Below is my review from May 17, 2014 ------ This app is awesome. It’s hard to believe how much it has changed in the short amount of time since I first started using it two months ago back in March. The developer has really listened to his users’ suggestions posted on his forum, and he has worked hard to make this app a workhorse for the traveler. In fairness to the developer I hope the folks who reviewed an early version take the time to update their reviews based on the current version. So many new features and improved usability! — Pictures can be dragged to pins (both Route Pins and Point of Interest Pins). A photo of that clam shack you’re going to visit, or the train station in Barcelona so you’ll know it when you see it. — Activities can also have a picture. Running with the bulls. Cog Railway up Mt. Washington. Rockin’ in Ibiza. Your hotel. Your friend’s house. — And all of these pictures can be printed in the itinerary along with all the other information associated with each Route Pin, Point of Interest Pin, and Activity. The itinerary becomes a very complete blueprint of your trip with all the details included. Not only is the format of the itinerary attractive, but when you print it you can each Route Pin start a new page. — There may be many websites you want to reference during your journey. No longer is the app limited to just a single site per pin… each pin can now have an unlimited number of sites. This is a superb app, worth every penny. The more you use it, the more you’ll appreciate it. ——— Below is my review from May 4, 2014 ——— Wow… in a little over a month you would not believe how much functionality has been added to this app! Almost every request I’ve sent to the developer has been added. - increased work area layout with panels that can be easily hidden/displayed with a double-click - can now indicate non-car routes (plane, train, bus, etc.) with a straight line - in addition to route pins on the map there are also Point of Interest pins (these are not routed) - many new fields have been added to route activities such as URL, email, address, phone number, confirmation number, etc. - the formatting of the itinerary is much improved with boldface, italics, indents, bullets and underscores - template for TO DO and PACKING list has been added - performance enhancements I realize there are some 1-star, 2-star, and 3-star reviews for the earlier version (before v2.0). If those users stay current with this app I hope they re-write their reviews based on the current 2.0 version. This is without a doubt THE PREMIER route planning app! ——-- Below is my review from Mar 24, 2014 ------ I’m giving this app FIVE stars, because I am so impressed with the response of the developer. I have experience with other trip planning software so before I purchased the app I asked the developer a few questions via email and he answered very quickly. So I bought the app at the beginning of the weekend and spent the entire weekend booking hotels and flights and planning rail trips and activities for a 1-month trip to Europe. I used Road Trip Planner to record everything I need to know in a single itinerary. As I used the app I discovered features I felt were missing or could be improved so I jotted off emails to the developer. In each case he replied almost immediately. In fact, he started a Google Group for users to post suggestions and enhancements, and already it is quite an active group with a lot of participation by the developer. Users respond to other’s ideas and the developer will try to give priority to the most popular ideas. Also, the developer just announced on the company website that an iPhone companion app will be released next month. Great! So there’s a lot of activity and buzz. Many users like myself are looking for a replacement for Street & Trips that is Laptop based. Roadtrip Planner is not that replacement. In my usage, the program has many weaknesses; Very difficult to learn the command structure, doesnot print an organized inteniary that uses acceppted road & highway names, the logarythems do not offer routing/planning options, cannot print a route map in connected sections for longer trips, difficult to export files as .gpx to portable devices without errors/glitches and the biggest weakness is only works on Apple Maps. Positives are; Roadtrip is the best trip planner offered in the APP store, doesn’t crash or lock up. Works in a pinch if you don’t want to get out your Windows Laptop fired up.